In June, 1989, Ralph Wakeman opened "Fix-It Small Appliance Repair" in an old boiler room just off Main Street Woodstock, VA. Initially servicing vacuums, mixers, and other household appliances, Ralph swore he'd never mess with sewing machines. In 1990 "Fix-It" became a registered member of the VDTA (Vacuum & Sewing Dealers Trade Association), repairing sewing machines. After four long lonely years in Edinburg, the shop moved to its current location in Woodstock and changed its name to "Shenandoah Sew and Vac." 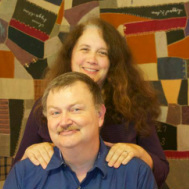 In 2006, Barb Lambert started our craft centered half-- "Quilter's Cabin." Today, Shenandoah Sew and Vac offers quality vacuums cleaners and sewing machines as well as skilled repairs, vacuum bags, cleaning solutions, and quilting classes.